often asked, implies that we want to share with others this intense sensation that comes from the body’s emotional base, a sensation best summed up in the French term ‘frisson,’ which is defined as aesthetic chills or emotion-centered shudders from music, art, and ideas. This sensation on the skin signifies an emotional rush and clarity. 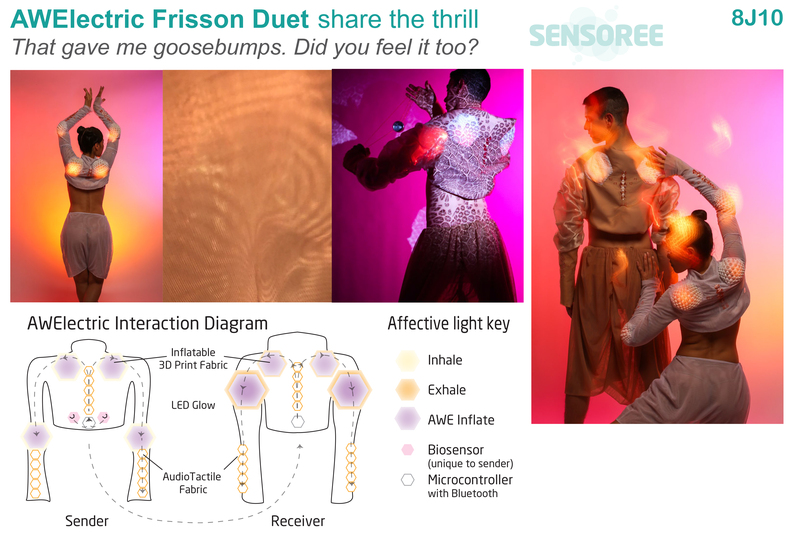 We sought to create a goosebump prosthetic to illustrate this latent sense in a tangible interaction that enhances the phenomenon and shares it. The AWElectric (2015) is a duet design that animates the emotionally charged goosebumps, amplifies them, and shares the thrill. A series of biosensors monitors excitement and translates breathing to a pulsing orange glow. 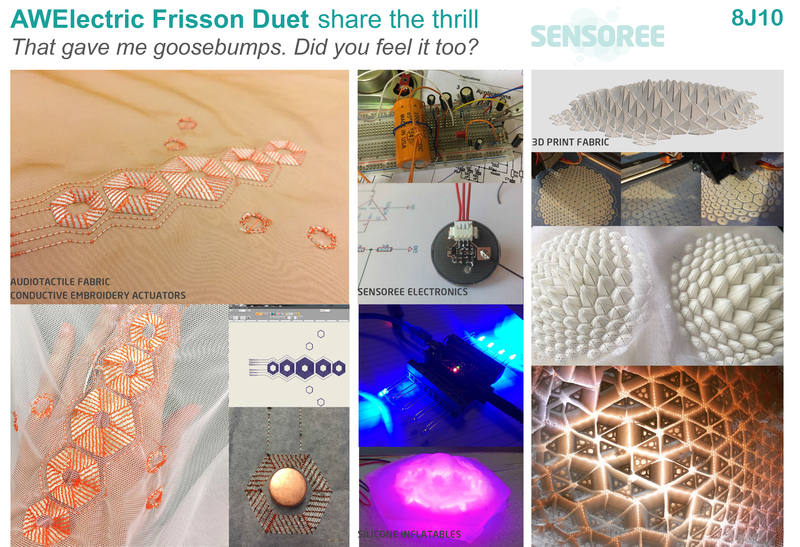 A peak of excitement conotes awe and inflates 3d printed Goosebump Fractal fabric with a violet tremor and initiates the AudioTactile embroidered speaker fabric to send the frequency to tickle the skin and evoke frisson in the partner. 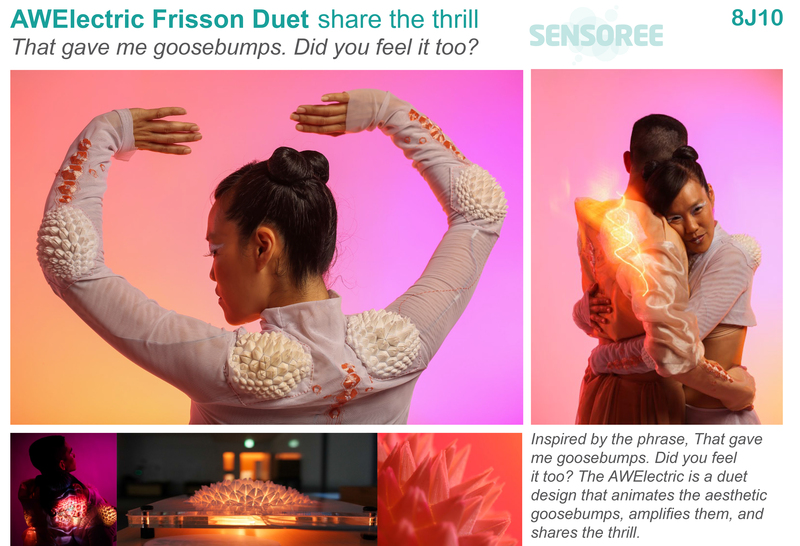 3D print fabric Goosebump Fractals are inspired by the human body that requires connective tissue betweens the bones. This fabric has joint material between the 3d prints to mimic our articulations, gestures, and expressions. The hexagon construction of the Goosebump Fractals are digital representations of skin cells. Inspired by Buckminster Fuller’s Geodesic domes, the hexagon spike separates into 6 triangles to animate the hair follicles at the emotional peak. In the current design the communication of awe is half-duplex. The sensing part is located in the female “sender” design and reads the emotional peak. This triggers the actuation of the air pumps to inflate the 3D print fabric modules and vibrates the embroidered speakers up the back and down to the forearms. Then, the male “receiver” design AudioTactile fabric remotely plays the goosebump frequency and inflates his 3d print fabric Modules.